Trump promises 'tough sanctions' on Iran, blasts ballistic missile program and slams Iran deal's lack of enforcement. United States President Donald Trump announced Friday that he will not certify Iran's compliance with the 2015 nuclear deal. Trump said that while the US wouldn't scrap the deal, it could "leave at any time". Speaking at the White House, Trump said that “We cannot and will not make this certification. We will not continue down a path whose predictable conclusion is more violence, more terror and the very real threat of Iran’s nuclear breakout." Trump used the speech to slam Iran, who he called a "fanatical regime" whose "aggression continues to this day. The regime remains the world’s leading state sponsor of terrorism," he said, pointing out that "the regime’s two favorite chants are ‘Death to America’ and ‘Death to Israel". Trump said that the United States would level new sanctions on Iran’s Revolutionary Guard Corps, and vowed to block the Islamic Republic's financing of terrorism around the globe. In his speech, Trump slammed the 2015 Iran deal for what he called its lack of enforcement and for permitting Iran to make the move for a nuclear weapon after ten years. "In just a few years, as key restrictions disappear, Iran can sprint towards nuclear weapons breakout. What is the purpose of a deal that only, at best, delays Iran?" Trump asked. "Iran will never, ever, get a nuclear weapon," Trump concluded. 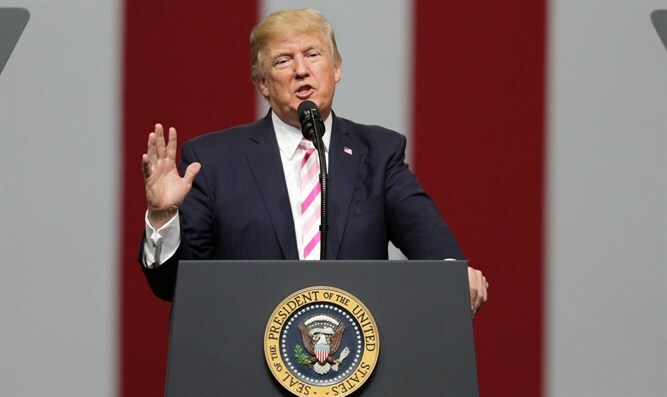 President Trump is slated to officially report to Congress this Sunday on whether the Iranian regime is complying with the 2015 Joint Comprehensive Plan of Action (JCPOA). Failure to recertify Iranian compliance would pass back to Congress the decision on whether to reimpose sanctions on Iran.